You are here: Home / Windows / How to Enable Delete Confirmation dialog in Windows 10? I am not sure how and when it got changed but whenever I am deleting any file on my Windows 10, it doesn’t ask for Confirmation before delete. That’s strange and sometimes bit risky ! 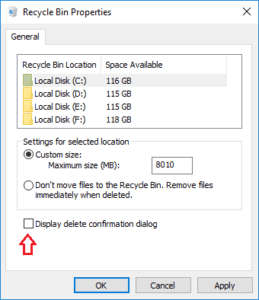 So, How to Enable Delete Confirmation dialog in Windows 10? First of all Don’t Panic . Select ‘Properties’. This will open following dialog box. If ‘Display delete confirmation dialog’ checkbox is unchecked then select it and Apply > Ok on dialog box. Now if you try to delete any file on your Computer and check it will pop up confirmation message !